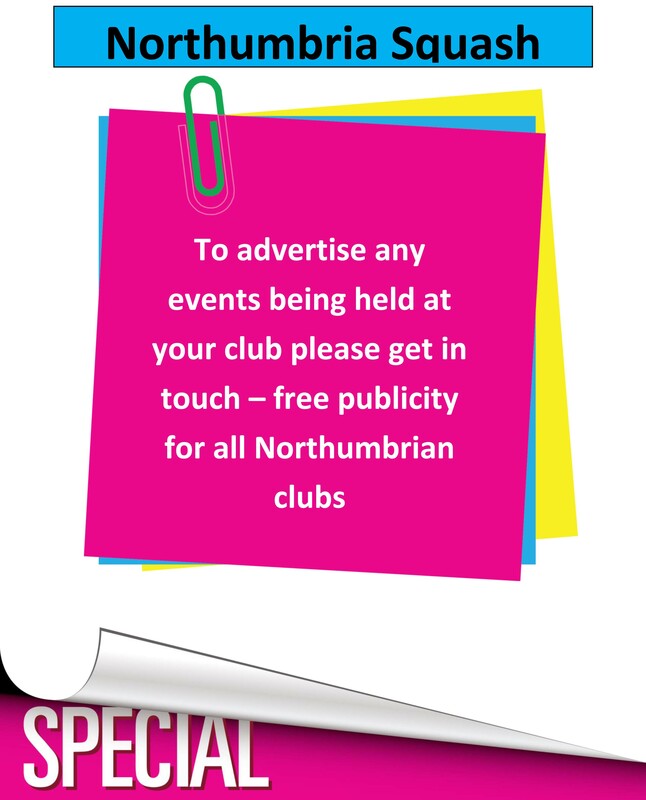 Northumbria (with it’s ageing population) now has two teams in the O60 ICC category. Apologies to Adrian as no up to date photographs were provided. The Northumbria Men’s Over 60 first team was in action at Chapel Allerton on 28/29 October 2017 against hosts Yorkshire followed by Lancashire and Cheshire. 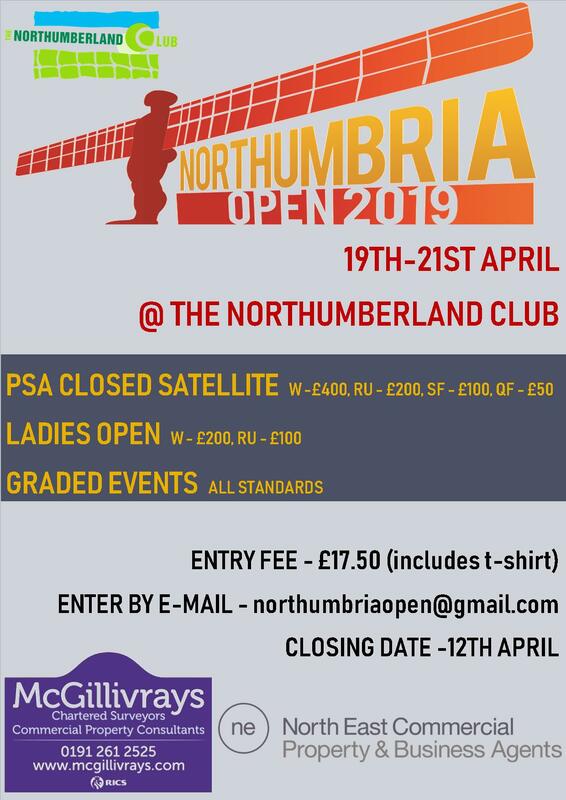 The Northumbria squad was current County O60 Champion Ron Freeman, County O60 runner-up and Welsh O60 Champion Adrian Alderton, and County O60 semi-finalists Andrew Wilkinson and John Thompson. In Saturday’s opener against Yorkshire, Andrew was unable to overcome a severe bout of flu and lost 3-0 to an opponent he would normally have been expected to beat. Ron played brilliantly to beat Anthony Kettlewell 3-0 and the match then hinged on Adrian, who played very well to lead 2-1 but eventually went down 3-2 in a marathon match, giving Yorkshire the match win 2-1 (9-5). For the Saturday evening match against Lancashire, John was brought in to replace Andrew (who had returned home to bed), but lost 3-0 to Alan Connor. Ron pushed Peter Upton all the way in a very skillful and entertaining match, leading 2-1 but eventually losing 3-2, and Adrian went down 3-0 to Ian Bradburn, so match to Lancashire 3-0 (12-2). In the other Saturday matches Lancashire had beaten Cheshire 3-0 (12-0) and Yorkshire had beaten Cheshire 2-1 (9-4). 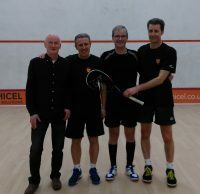 On Sunday morning against Cheshire, we finished off in style, with John, Ron and Adrian all winning 3-1 for a match score of 3-0 (12-3) to Northumbria. Meanwhile Lancashire completed a 3-0 (12-1) win over Yorkshire. So although we finished level on points with Yorkshire, their win in the head-to-head against us, and their single point against Lancashire, were just enough to put them in second place above us and unfortunately leave us in the second-half Premier relegation weekend along with Cheshire, Buckinghamshire and Dorset. With everyone fit and available, this squad should surely be good enough to preserve its Premier status for another season. Our team squad was Alan Coates, Colin McNestrie and Mike Cherryman. We had a number drop outs before the weekend some injury’s & players away. Mike dropped out mid week before the games, but recovered sufficiently to play as we were down to 2 players. Our 1st game was at 2pm against Merseyside – with Mike up 1st and starting well by racing to a 2 love lead, Ian his opponent came back strong in the 3rd to put pressure on Mike but Mike was to strong winning 3-1. Alan was next up at number 1 – Tommy his opponent was quite a strong player just keeping his nose in front, with his badminton style flicks coming out winning in 3 games. Last up was Colin with the match tied at 1 all with his serve and drops working well he was always in control and won in 3 games. Northumbria won the tie 2-1. 2nd Match against Lancashire – Mike played again played 1st against a fresh opponent although he played well, 2 games in 4 hours was a little to much for him loosing 3-0. Alan’s match went all the way to 5 games, with Alan having a match ball in the 4th but he could not close out the game. This was the game of the day, it could have gone either way.